Ten and 15 years ago, restaurants were trying to reinvent the wheel. Fusion was so free spirited that terrible mistakes were made. Remember bulgogi cupcakes, savory ice cream or haggis pizza? Hopefully you don’t, but I do. Some terrible ideas became ridiculously popular, too, so there will always be more. Think about boneless processed chicken nuggets and sweet potato french fries. Still, more places today seem to focus on upgrading traditional existing restaurant genres than creating something wildly different. I have become a fan of two such restaurants, both new in 2018. Teddy Maroon’s physically looks conflicted about its identity. Is it a sports bar or a restaurant? Actually, it’s both. TVs are exclusively in the bar room and the private party room. The dining room offers privacy with tall booths shielding a party from both the bar and other diners. There is no confusion about the menu, though; it’s pure sports bar fare, superbly done. Those boneless chickens I mentioned above are usually dried out from overcooking. The ones I tried here were not. They were coated in a cornflake batter that I last recall at Jimmie’s American Café. It’s flaky and crisps so well I wonder why it disappeared from the scene. Burgers here are busy. All come with two large patties. Why is it so hard to find a single patty burger? They are so rare that some places call them “small.” All come with three to five extra ingredients unless you go Bobby Dupea (in a famous a diner scene from “Five Easy Pieces”). Still, the burgers are served on South Union’s fabulous burger buns, and one topping includes blistered shishito peppers. Patties are well seared. Among sandwiches, the Teddy Roosevelt (sliced prime rib) stood out. I was told it is the most popular item on the menu. Garlic fries, kale salads, roasted Brussels sprouts and an arugula side salad were among side dishes I liked. My favorite appetizers were the blistered peppers, the chicken tenders and especially the roasted cauliflower with Romesco, almonds and Feta. Little known fact — the parking lot behind the restaurant is free for customers. Get your ticket validated if you stay more than an hour. Beware of sitting by the large windows. They are really cold when the sun isn’t shining. The newest of four area Wasabi cafés is in Johnston, and it ups the sushi game (which no one does better than Wasabi ) by adding superb ramen to the menu. The ramens mostly are made with chickens that are exclusively free ranged. It’s the best chicken stock I have ever tasted. 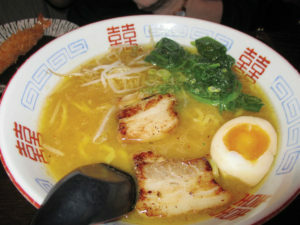 Types of ramen include tonkatsu (pork tenderloin), beef and shrimp besides chicken. Noodles are sourced from New York, where most great ramen house noodles in the U.S. also go for noodles. While the sushi, sashimi and entrees are superb, they do not differ much from the other three Wasabi places in the metro. Presentations are fabulous, and so are the fish. Having four restaurants makes seafood air freight deliver more affordable. Blue fin, horse mackerel, uni (sea urchin roe), baby yellowtail, and toro are usually available. Brussels sprouts, dumplings and shishito peppers starred on the appetizer menu. One entrée of note is the 48-hour miso marinated salmon. It produces a flavor unlike any other I have found on salmon. Like all Wasabi’s, the trappings are fabulous. Dinnerware, furniture, wall murals and the back-lit bar are all of top fine dining quality. Saturday: noon – 10:30 p.m., Sunday: noon – 9 p.m.
Saturday: 10 a.m. – midnight, Sunday: 10 a.m. – 9 p.m.